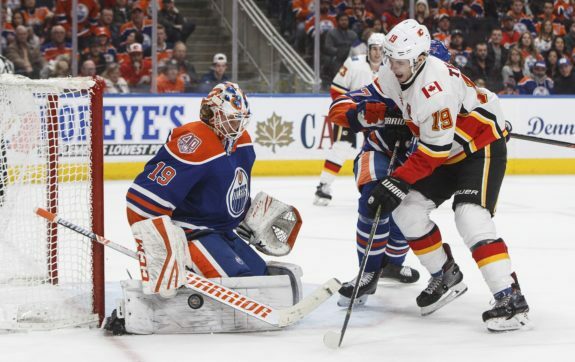 EDMONTON — Mikko Koskinen made 24 saves to record his third shutout of the season as the Edmonton Oilers won a tight battle between a pair of hot teams, defeating the Calgary Flames 1-0 on Sunday. Connor McDavid scored the game’s lone goal for the Oilers (16-12-2), who have won three straight and have gone 6-1-0 in their last seven games. The Flames (19-10-2) had a five-game winning streak snapped, but are 9-2-1 in their last 12 outings. David Rittich made 29 saves in a losing effort for Calgary. Edmonton got the game going 12 minutes into the opening period with some nice passing by the top line, which was finished off when Alex Chiasson fed it to McDavid at the side of the net and the Oilers captain sent his 16th of the season past Flames goalie David Rittich. The Oilers came out of the gate flying in the second, but Rittich made huge breakaway saves on Ryan Nugent-Hopkins and Leon Draisaitl. Calgary looked to have tied it up midway through the middle period, but Anthony Peluso — who was recalled earlier in the day from the American Hockey League’s Stockton Heat — was flagged with goaltender interference on Koskinen after the video review. McDavid came close to adding another one on the power play with four minutes left in the third, but rang his shot off the crossbar. Calgary poured on the pressure at the end, but Edmonton was able to hang on. The Oilers begin a two-game trip in Colorado on Tuesday. The Flames make a one-game trip back home to play Philadelphia on Wednesday. Notes: It was the second of four meetings between the Alberta rivals with Calgary scoring three third-period goals in a come-from-behind 4-2 victory on Nov. 17… The Flames were without a couple of key players as forward Mikael Backlund is out with a concussion, while defenceman Mark Giordano was serving part of a two-game suspension for kneeing Minnesota’s Mikko Koivu.